Alfa Laval, a global provider of specialized products and engineering solutions based on the key technologies of heat transfer, separation and fluid handling, has expanded its Test & Training Center in Aalborg, Denmark with the commissioning and operation of a new gas testing facility, increasing the company’s test space to five times its original size and making it one of the most advanced test centers in the world for environmental and combustion technology regardless of fuel type. Since its inauguration in 2014, the Alfa Laval Test & Training Center has been a hub of the company’s research and development in exhaust gas cleaning, ballast water treatment, steam production, fuel cleaning and other key marine technology areas. Its original 250 cubic meter test space is essentially a full-size machine room on land and is equipped with Alfa Laval products that are installed and integrated into large process testing lines centered around a 2 MW marine engine. The company has now added a further 1100 cubic meters of test space to focus on combustion technologies for gas and other fuels including the installation of new burner and inert gas systems as well as the full-scale Alfa Laval Gas Combustion Unit (GCU). Alfa Laval already has a broad portfolio of technologies for employing gas as fuel and carrying gas as cargo, including dual-fuel boiler systems, the Alfa Laval FCM One Gas booster system, Alfa Laval Smit inert gas systems and the Alfa Laval GCU, as well as a range of heat exchangers for working gas at various pressures. The company will be adding more systems in the immediate future. 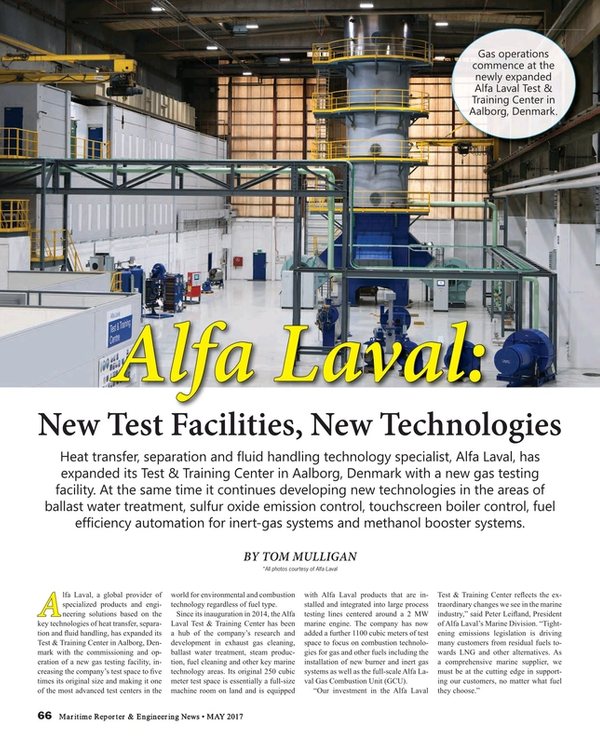 Technology development is already underway in the newly expanded Test & Training Center: Alfa Laval is currently testing a new dual-fuel burner for gas-diesel applications on smaller boilers, which will later be developed into a multi-fuel solution in partnership with the Technical University of Denmark. The Center is also running a development project for large burners and boilers, with in-depth testing using both gas and diesel flames. In addition, the GCU will be used to test flame and heat flow characteristics under different operating conditions and thereby identify possibilities for improving performance even further. With the IMO Ballast Water Management (BWM) Convention taking effect in September this year, Alfa Laval has reported increased customer interest in ballast water treatment systems and its Alfa Laval PureBallast technology, a chemical-free system based on the Enhanced UV Reactor, developed jointly by Alfa Laval and Wallenius Water. The company has seen particular interest in PureBallast systems with high flow capacities: its IMO and U.S. Coast Guard (USCG) type-approved PureBallast 3.1 features a single-filter, small-footprint solution that enables higher capacities of ballast water to be processed (up to 6000 cubic meters per hour). The company recently completed an agreement to supply two Korean newbuild LNG carriers with installations comprised of two parallel 3000 cubic meter per hour systems. Alfa Laval says the benefits of its PureBallast technology include reduced installation costs and lower operating costs, giving substantial savings over a vessel’s life cycle during regulation-compliant operation. “The high interest in Alfa Laval PureBallast provides clear evidence of growth in the retrofit market, and there are many reasons this is happening right now,” said Anders Lindmark, Head of Alfa Laval PureBallast, Alfa Laval Marine Division. “We have received lots of interest directly tied to our recent USCG type approval, and we are also seeing greater numbers of shipowners preparing for the IMO Convention. Launched in 2012 to enable vessels to meet SOx limits while using heavy fuel oil, Alfa Laval’s PureSOx is a complete sulfur oxide scrubber platform, with multiple operating arrangements, two scrubber designs and a range of compliance profiles that meet the IMO 2020 global sulfur cap. Alfa Laval has developed technologies not only employed in the scrubber itself, but also in the patented separator technology of its water cleaning unit and in the heat exchangers used for cooling the circulation water. In addition, PureSOx has played a central role in much of the research work carried out at the company’s Aalborg facility, where the scrubber at the Test & Training Center has been used not only to develop the PureSOx platform, but also to solve individual customer challenges in exhaust gas cleaning. Designed for 1.5 MW operation, the scrubber can be operated at its physical limits by the Center’s 2 MW engine, which would be an unsafe and impractical procedure on board ship. Improvement of the PureSOx platform by Alfa Laval has mainly been focused on system size and resource use. A significant size reduction for the U-design scrubber was announced last year and tests have been performed with many different filling elements and sprayer arrangements to find the lowest possible water consumption. Minimizing pressure drop across the system, which reduces fuel consumption by the engine, is a further area of focus. Alfa Laval Touch Control is a new system being rolled out by the company, the first units being for Alfa Laval Aalborg OL and OC-TCi boilers, enabling advanced boiler control with a simple touch. With a graphical touchscreen display and intuitive two-touch navigation, the technology represents a significant advance in boiler control technology. Designed as a common control platform for all Alfa Laval Aalborg boilers, the company intends that the system will become a familiar interface for crews, regardless of which boiler they work with, and it has already been installed on board a range of newbuilds, with additional deliveries planned for the near future. In addition to having been proven in the engine room on other marine systems from Alfa Laval, Touch Control is in use at the Alfa Laval Test & Training Center, where it steers the Center’s own boilers and aids the continuous development and improvement of systems for new boiler types, the Touch Control rig being used to show the many ways in which boiler operation can be optimized. The system is PLC-based, which gives it plug-and-play simplicity and high durability in the engine room, and with coverage for all major bus interfaces it is easily connected to onboard communication systems. Similarly, it can be quickly retrofited to an existing Alfa Laval Aalborg OL, OS-TCi or OC-TCi boiler, which has already been done on a number of tanker vessels. It also offers the flexibility of firmware upgrades, which will let the system adapt to new needs as they arise. The Alfa Laval Automatic Fuel Efficiency Module (AFEM) is a new modification for reducing the fuel consumption of Alfa Laval Smit Combustion inert gas systems by ensuring the inert gas that keeps cargo safe during offloading is only generated in the exact amounts required. In a two-year pilot project, the AFEM allowed Italian shipping company Navigazione Montanari S.p.A. to achieve average fuel savings of 30 per cent. Based in Fano on the Adriatic Sea, Navigazione Montanari owns and manages a fleet of 21 tankers operating worldwide, with a particular concentration throughout the Mediterranean region. In recent years, the company has been focused on improving environmental standards, especially with regard to minimizing CO2 production and fuel waste and therefore taking part in a pilot project to evaluate the AFEM was a natural fit for it. Valle di Navarra, a 40,000 DWT product carrier built in 2002, was selected as the test vessel. The ship sails primarily in the Mediterranean, with gasoil and gasoline cargo. Compared to similar vessels with Smit Combustion systems, the Valle di Navarra discharges frequently – up to three times a week – which provided Alfa Laval with ample statistical information on the AFEM’s performance and reliability. Alfa Laval’s engineers provided responsive assistance and support to ensure the AFEM performed properly and that the inert gas system only produced the necessary amount of inert gas during offloading. This made it possible to greatly reduce the operational expenses related to inert gas production aboard the ship. For vessels with Smit Combustion systems already installed, the AFEM will soon be available as a retrofit installed and commissioned by Alfa Laval. For new inert gas systems, the AFEM will be available as an added option at the time of the original installation. In 2013, Alfa Laval was selected by MAN Diesel & Turbo to deliver Low-Flashpoint Supply Systems (LFSS) for the world’s first methanol-fuelled tankers. The methanol booster systems performed extremely well on methanol-fuelled tankers with ME-LGI engines and now Alfa Laval is further supporting MAN Diesel & Turbo with methanol booster technology as the MAN engine series is further developed to work with LPG. The finished booster technology, the Alfa Laval FCM One Low-Flashpoint (LF), was installed on tankers built at Minaminippon in Japan and Hyundai Mipo Dockyard in Korea. The vessels’ three owners, MOL, Westfal-Larsen and Marinvest, have since logged more than 4500 running hours with the FCM One LF in the past three years. New booster developments are already underway. MAN Diesel & Turbo is currently modifying the ME-LGI engine series to use LPG as an alternative fuel, and Alfa Laval is again preparing the booster system. After more than one year of development, the first Alfa Laval FCM One LPG will be tested at MAN Diesel & Turbo’s Copenhagen test site in Denmark.